The Church serves both the Inner and Middle Temple, who own the freehold and are jointly responsible for its upkeep, though it has the status of a royal peculiar rather than a private chapel. The incumbent, known since the fourteenth century as the Master of the Temple, is appointed by the Crown, this right of appointment having been reserved when the Church was granted to the two Inns in 1608. As a peculiar, the Church is outside any episcopal or archiepiscopal jurisdiction; and the Master therefore takes his place by patent, without induction or institution. The Master is entitled to a house, provided at the cost of the two societies. There is also a Reader, appointed by one of the two inns by turns. The Church has a strong musical tradition, brought to wide public notice under the long directorships of Sir Walford Davies (organist 1898-1923) and Sir George Thalben Ball (organist 1923-82). The old organ, destroyed in the Blitz, was made after a fierce building competition which was adjudicated upon by Lord Chancellor Jeffreys, a former bencher of the Inner Temple. 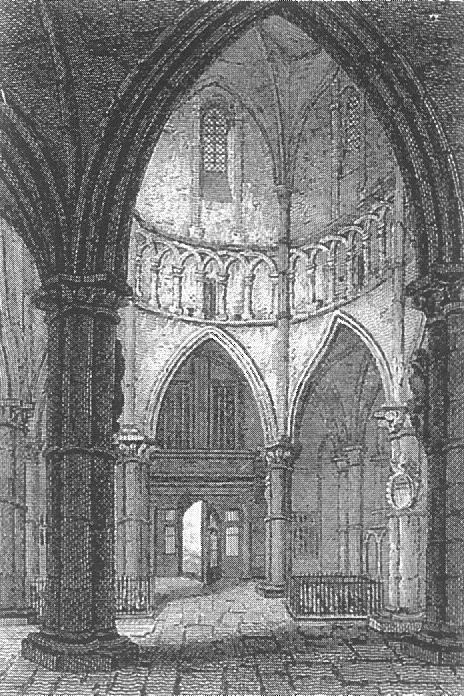 Members of the Inner Temple traditionally sit on the south side of the Church, the southern half being assigned to the Inn under the 1732 deed of partition. The custom was relied on by the Inn in former times as indicating its precedence over the Middle Temple: a disputed claim which has long ceased to possess any significance. It also explains the inscriptions on the outside and inside of the Round, which record the restoration of the south side by the Inner Temple in 1827, when John Gurney was Treasurer.